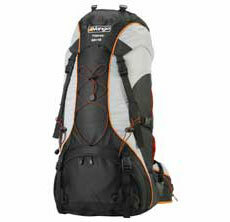 Vango says:"Inspired by the grandeur of the mountain ranges of South America, this mountain pack is our elite edition. Researched, tried and tested to the extremes, you won't be disappointed by this pack. With precision fit, a quick adjustable A3 back system and 'acetyl' dual support rods, you can be assured of comfort and stability even when carrying the heaviest of loads"
A3 Advanced Anatomical Adjustment. This offers stability, comfort and a precise 3D controlled fit which in turn promotes confidence when carrying large loads. Ergonomic hip belt which is shaped for comfort. Body contact points which are made of Air Mesh to keep you cool & comfortable. Flexi-Adjust sternum strap which is easy to adjust. Two main compartments with a divider which allows flexibility and easy packing. Hydration compatible, so you can have liquid on the move. Detachable rain cover so your pack and its contents are kept dry. Extension sleeve with a drawcord and top compression strap that gives extra space, keeps out the rain and helps secure the load. Side pockets which expand and have dual compression straps to give you extra space. Twin attachment points to help you carry walking poles or ice axes with ease. Shockcord accessory web down front. Lower side mesh accessory pockets that give you quick & easy access to essential bits and pieces. The Vango Fitzroy 60 + 10 Rucsac is from Vango's Expedition range - so it's designed for use when carrying large loads over long distances in rugged terrain. For this type of product the most important considerations are the comfort and stability of the harness plus the pack's durability and build quality. I tested this with a load I would have on a typical 3-4 day camping trip. The harness system can be adjusted at a gross level by moving the main shoulder anchor point vertically and then making a finer adjustment with the shoulder straps. As a result it was very easy to get a good fit. The hip-belt has substantial padding and the level of stiffness is good. It was easy to open, close and adjust - even wearing thick gloves. There's also an effective lumbar support feature plus raised foam ribs which helped the airflow between my back and the pack. All-in-all the harness worked well in distributing the weight onto my hips. The pack also felt quite stable throughout the day's walk. The shoulder straps are adjustable and nicely padded. There's also an adjustable sternum strap though I found it to be a bit stiff and difficult to open. It does snap shut easily though and was easy to adjust - both laterally and vertically - which is a nice feature for added comfort. The shoulder straps also include various fastening loops for GPS and/or Compass and the drinking tube from a hydration system. Incidentally, the sternum strap fastening clip is moulded to form a rudimentary whistle - which is not only incredibly useful but potentially a life-saving feature. The lid of the Vango Fitzroy 60 + 10 Rucsac has a good sized pocket large enough for an OS map and includes a plastic karabiner (for eg keys, penknife) plus a zipped internal pocket. The lid also has loops for attaching a bed roll or insulation mat. Each of the two external, mesh side pockets are large enough for a water bottle and include elasticated clips to hold the bottle in place. There are also two external zipped side pockets, each large enough for several OS maps and for stowing all those items you need regularly or quickly. There are two base loops with accompanying elasticated attachment points for carrying walking poles and/or ice-axes. Two further adjustable straps are available for attaching a one or two man tent to the outside of the bag. The main bag body of the Vango Fitzroy 60 + 10 Rucsac can be divided into two compartments by a toggled drawcord and you can access both compartments from the outside - via the lid for the top one and a zipped opening for the bottom, sleeping bag, compartment. This means you can erect your tent, roll out your insulation mat and deploy your sleeping bag (or pack it all up) without having to open your rucksack, exposing all your belongings to the elements - essential during inclement weather. All the external zips were relatively solid and chunky and had toggles to help when operated with gloved hands. The fabric used for the main body includes a denser, texturised material for additional abrasion resistance. The base has some additional re-inforcement - where there's often a lot of wear and tear. Overall the build quality feels and looks good. The fabric is water resistant and there is a bright orange rain cover (good for being spotted by the rescue services!). Whilst shower-proof the Vango Fitzroy 60 + 10 Rucsac is not fully water-proof so you will need to stow all your belongings in robust plastic bags to ensure they stay dry - but this is good practice anyway. Apart from the shoulder straps, there is also handle at the top and a second handle on the side so you can carry the rucksack like a suitcase. Ideal for regular, extended backpacking and camping trips where you need to carry a lot of gear over long distances and rough terrain. I found the Vango Fitzroy 60 + 10 Rucsac very comfortable - it is well worth looking at and comes highly recommended. For single day walking in all weather and seasons the Vango Fitzroy 60 + 10s Rucsac is everything you need and much more.